Jenna Earley, a Harrisburg native, is a Government Affairs Professional for Gmerek Government Relations in Harrisburg, PA, an organization which dedicates its practice to the representation of clients’ needs before Pennsylvania state government. Ms. Earley is responsible for researching legislation and regulatory proposals, working with Coalitions to develop and coordinate with grassroots efforts, developing effective policy strategies, and working with State Legislators in the best interest of her clients. Ms. Earley was previously the Marketing Director for the American Council of Engineering Companies of Pennsylvania, where she was the primary communication liaison between the association and 130 member firms throughout the Commonwealth of Pennsylvania. She also serves on several Board of Directors for local non-profits and volunteers time with Junior Achievement of Central PA, where she mentors high-school girls. 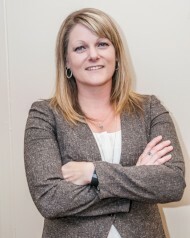 Ms. Earley holds two degrees; A Bachelor of Arts in History from Millersville University and a Master of Public Administration from Shippensburg University. She resides in Cumberland County with her husband, Brad; son, Ty; and Australian Shepard, Blue.